In mathematics, four-dimensional space (“4D”) is a geometric space with four dimensions. It is typically meant to mean four-dimensional Euclidean space, generalizing the rules of three-dimensional Euclidean space. It has been studied by mathematicians and philosophers for over two centuries, both for its own interest and for the insights it offered into mathematics and related fields. Algebraically it is generated by applying the rules of vectors and coordinate geometry to a space with four dimensions. In particular a vector with four elements (a 4-tuple) can be used to represent a position in four-dimensional space. The space is aEuclidean space, so has a metric and norm, and so all directions are treated as the same: the additional dimension is indistinguishable from the other three. In modern physics, space and time are unified in a four-dimensional Minkowski continuum called spacetime, whose metrictreats the time dimension differently from the three spatial dimensions (see below for the definition of the Minkowski metric/pairing). Spacetime is not a Euclidean space. Lagrange wrote in his Mécanique analytique (published 1788, based on work done around 1755) that mechanics can be viewed as operating in a four-dimensional space — three of dimensions of space, and one of time. In 1827 Möbius realized that a fourth dimension would allow a three-dimensional form to be rotated onto its mirror-image,and by 1853 Ludwig Schläfli had discovered many polytopes in higher dimensions, although his work was not published until after his death. Higher dimensions were soon put on firm footing by Bernhard Riemann’s 1854 Habilitationsschrift, Über die Hypothesen welche der Geometrie zu Grunde liegen, in which he considered a “point” to be any sequence of coordinates (x1, …, xn). The possibility of geometry in higher dimensions, including four dimensions in particular, was thus established. An arithmetic of four dimensions called quaternions was defined by William Rowan Hamilton in 1843. This associative algebra was the source of the science of vector analysis in three dimensions as recounted in A History of Vector Analysis. Little, if anything, is gained by representing the fourth Euclidean dimension as time. In fact, this idea, so attractively developed by H. G. Wells in The Time Machine, has led such authors as John William Dunne (An Experiment with Time) into a serious misconception of the theory of Relativity. Minkowski’s geometry of space-time is not Euclidean, and consequently has no connection with the present investigation. As an example, the distance squared between the points (0,0,0,0) and (1,1,1,0) is 3 in both the Euclidean and Minkowskian 4-spaces, while the distance squared between (0,0,0,0) and (1,1,1,1) is 4 in Euclidean space and 2 in Minkowski space; increasing actually decreases the metric distance. This leads to many of the well known apparent “paradoxes” of relativity. In the familiar 3-dimensional space that we live in there are three coordinate axes — usually labeled x, y, and z — with each axis orthogonal (i.e. perpendicular) to the other two. The six cardinal directions in this space can be called up, down, east, west, north, and south. Positions along these axes can be called altitude, longitude, and latitude. Lengths measured along these axes can be called height, width, and depth. Comparatively, 4-dimensional space has an extra coordinate axis, orthogonal to the other three, which is usually labeled w. To describe the two additional cardinal directions,Charles Howard Hinton coined the terms ana and kata, from the Greek words meaning “up toward” and “down from”, respectively. A length measured along the w axis can be called spissitude, as coined by Henry More. The geometry of 4-dimensional space is much more complex than that of 3-dimensional space, due to the extra degree of freedom. Just as in 3 dimensions there are polyhedra made of two dimensional polygons, in 4 dimensions there are polychora (4-polytopes) made of polyhedra. In 3 dimensions there are 5 regular polyhedra known as the Platonic solids. In 4 dimensions there are 6 convex regular polychora, the analogues of the Platonic solids. Relaxing the conditions for regularity generates a further 58 convex uniform polychora, analogous to the 13 semi-regular Archimedean solids in three dimensions. In 3 dimensions, a circle may be extruded to form a cylinder. In 4 dimensions, there are several different cylinder-like objects. A sphere may be extruded to obtain a spherical cylinder (a cylinder with spherical “caps”), and a cylinder may be extruded to obtain a cylindrical prism. The Cartesian product of two circles may be taken to obtain aduocylinder. All three can “roll” in 4-dimensional space, each with its own properties. In 3 dimensions, curves can form knots but surfaces cannot (unless they are self-intersecting). In 4 dimensions, however, knots made using curves can be trivially untied by displacing them in the fourth direction, but 2-dimensional surfaces can form non-trivial, non-self-intersecting knots in 4-dimensional space. Because these surfaces are 2-dimensional, they can form much more complex knots than strings in 3-dimensional space can. The Klein bottle is an example of such a knotted surface .Another such surface is the real projective plane. This is part of the Friedmann–Lemaître–Robertson–Walker metric in General relativity where R is substituted by function R(t)with t meaning the cosmological age of the universe. Growing or shrinking R with time means expanding or collapsing universe, depending on the mass density inside. Research using virtual reality finds that humans in spite of living in a three-dimensional world can without special practice make spatial judgments based on the length of, and angle between, line segments embedded in four-dimensional space. The researchers noted that “the participants in our study had minimal practice in these tasks, and it remains an open question whether it is possible to obtain more sustainable, definitive, and richer 4D representations with increased perceptual experience in 4D virtual environments.” In another study, the ability of humans to orient themselves in 2D, 3D and 4D mazes has been tested. Each maze consisted of four path segments of random length and connected with orthogonal random bends, but without branches or loops (i.e. actually labyrinths). The graphical interface was based on John McIntosh’s free 4D Maze game. The participating persons had to navigate through the path and finally estimate the linear direction back to the starting point. The researchers found that some of the participants were able to mentally integrate their path after some practice in 4D (the lower-dimensional cases were for comparison and for the participants to learn the method). As a three-dimensional object passes through a two-dimensional plane, a two-dimensional being would only see a cross-section of the three-dimensional object. For example, if a balloon passed through a sheet of paper, a being on the paper would see a circle gradually grow larger, then smaller again. Similarly, if a four-dimensional object passed through three-dimensions, we would see a three-dimensional cross-section of the four-dimensional object–for example, a sphere. A useful application of dimensional analogy in visualizing the fourth dimension is in projection. A projection is a way for representing an n-dimensional object in n − 1 dimensions. For instance, computer screens are two-dimensional, and all the photographs of three-dimensional people, places and things are represented in two dimensions by projecting the objects onto a flat surface. When this is done, depth is removed and replaced with indirect information. The retina of the eye is also a two-dimensional arrayof receptors but the brain is able to perceive the nature of three-dimensional objects by inference from indirect information (such as shading, foreshortening, binocular vision, etc.). Artists often use perspective to give an illusion of three-dimensional depth to two-dimensional pictures. The perspective projection of three-dimensional objects into the retina of the eye introduces artifacts such as foreshortening, which the brain interprets as depth in the third dimension. In the same way, perspective projection from four dimensions produces similar foreshortening effects. By applying dimensional analogy, one may infer four-dimensional “depth” from these effects. 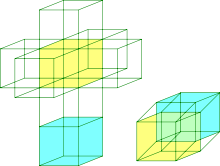 As an illustration of this principle, the following sequence of images compares various views of the 3-dimensional cube with analogous projections of the 4-dimensional tesseract into three-dimensional space. The image on the left shows the same cube viewed edge-on. The analogous viewpoint of a tesseract is the face-first perspective projection, shown on the right. Just as the edge-first projection of the cube consists of two trapezoids, the face-first projection of the tesseract consists of two frustums.The nearest edge of the cube in this viewpoint is the one lying between the red and green faces. Likewise, the nearest face of the tesseract is the one lying between the red and green cells. On the left is the cube viewed corner-first. This is analogous to the edge-first perspective projection of the tesseract, shown on the right. Just as the cube’s vertex-first projection consists of 3 deltoids surrounding a vertex, the tesseract’s edge-first projection consists of 3 hexahedral volumes surrounding an edge. Just as the nearest vertex of the cube is the one where the three faces meet, so the nearest edge of the tesseract is the one in the center of the projection volume, where the three cells meet. A different analogy may be drawn between the edge-first projection of the tesseract and the edge-first projection of the cube. The cube’s edge-first projection has two trapezoids surrounding an edge, while the tesseract has three hexahedral volumes surrounding an edge. On the left is the cube viewed corner-first. The vertex-first perspective projection of the tesseract is shown on the right. The cube’s vertex-first projection has three tetragons surrounding a vertex, but the tesseract’s vertex-first projection has four hexahedral volumes surrounding a vertex. Just as the nearest corner of the cube is the one lying at the center of the image, so the nearest vertex of the tesseract lies not on boundary of the projected volume, but at its centerinside, where all four cells meet. Note that only three faces of the cube’s 6 faces can be seen here, because the other 3 lie behind these three faces, on the opposite side of the cube. Similarly, only 4 of the tesseract’s 8 cells can be seen here; the remaining 4 lie behindthese 4 in the fourth direction, on the far side of the tesseract. If the wireframe of a cube is lit from above, the resulting shadow is a square within a square with the corresponding corners connected. Similarly, if the wireframe of a tesseract were lit from “above” (in the fourth direction), its shadow would be that of a three-dimensional cube within another three-dimensional cube. (Note that, technically, the visual representation shown here is actually a two-dimensional shadow of the three-dimensional shadow of the four-dimensional wireframe figure. Being three-dimensional, we are only able to see the world with our eyes in two dimensions. A four-dimensional being would be able to see the world in three dimensions. For example, it would be able to see all six sides of an opaque box simultaneously, and in fact, what is inside the box at the same time, just as we can see the interior of a square on a piece of paper. It would be able to see all points in 3-dimensional space simultaneously, including the inner structure of solid objects and things obscured from our three-dimensional viewpoint. Our brains receive images in the second dimension and use reasoning to help us “picture” three-dimensional objects. Just as a four-dimensional creature would probably receive multiple three-dimensional pictures. Reasoning by analogy from familiar lower dimensions can be an excellent intuitive guide, but care must be exercised not to accept results that are not more rigorously tested. For example, consider the formulas for the circumference of a circle and the surface area of a sphere: . One might be tempted to suppose that the surface volume of a hypersphere is , or perhaps , but either of these would be wrong. The correct formula is .